My doe is sneezing more and more. At first I thought it was when she ate or drank but now. Her nose is damp and the inside of her front paws are damp. I saw yellowish discharge come from her nose. I separated her from her kits. Her 5 kits as I said are only 3 weeks old. They are eating and drinking on their own. I think I will end up culling the doe but what should I do about the babies? Do I wait for signs? These kits are to be sold in 5 weeks - so how do I know if they are sick? Sorry about your doe! As you may have read, there is no reasonable cure for snuffles, and your decision to cull her is regrettably a wise one. The kits are usually protected from the pasteurella germ from the doe's antibodies until they're weaned. If bunnies in an exposed litter are going to get sick, they'll most often get sick by the time they're 8 weeks old. You'll want to cull the sick bunnies too. The offspring that are 8 weeks old and still healthy are not completely out of the woods health-wise. A few that remain healthy to age 9 weeks may very well start getting sick before they are 6 months old. Our experience shows that about 75% of the bunnies born to a sick doe will end up themselves getting sick. This is because their immune systems are as weak as their dam's. But that 4th bunny (the other 25%) will be just fine. And there's no way of knowing which is which, except through time. IF you sell these rabbits, we would strongly suggest the high ethical road of letting your buyers know that the mother had to be put down due to snuffles, and that you cannot guarantee their health at this time. It'd sure be great if you could cull the doe, keep the whole litter, and then use a healthy offspring that survives healthy to 6+ months to replace the sick doe. This way you'd improve your own animals, and down the road you'd have all healthy rabbits and no regrets. Just to complete the discussion: the stresses of pregnancy can decompensate the immune system and bring on snuffles. This might be what happened in your doe. 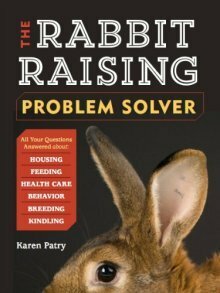 So, if you have the ability to save a female bunny, it is better to save 2 female bunnies, since one (or even both) might get sick once she is bred. The whole point of keeping babies from sick animals is to identify the ones that have truly strong immune systems. If you save bunnies, and test the immune systems through pregnancy, and are able to identify and keep truly healthy rabbits, in a year or 2 you'll end up with a truly healthy herd, and will no longer have to worry about the dreaded Pasteurellosis. That's an enviable place to be!